Replacement: None. This module has been retired and there is no direct replacement. This page is for reference only. Note: To send a NMEA command to the module, you need to send a \r\n or hit Ctrl-Enter to send the command from a terminal program. I recently bought the GPS Micro-Mini based on the MN5010HS GPS. 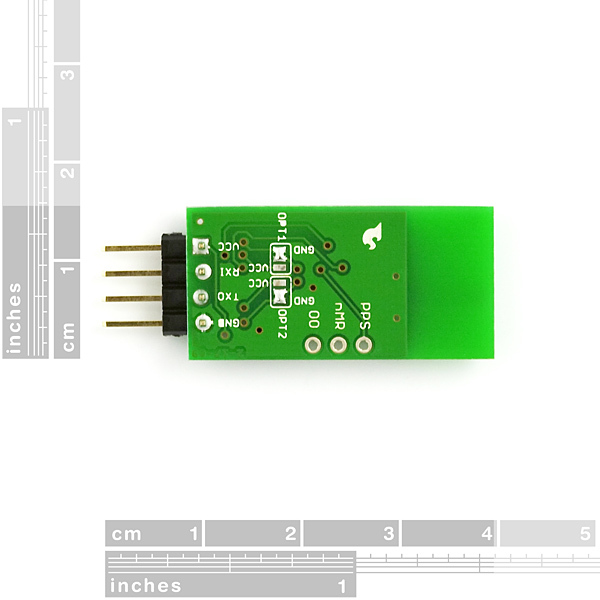 On the description of the product, you specify that there are selectable baud rate and NMEA and SiRF outputs from a jumper on the back of the board. On my product, I don't have any jumper!!! Moreover the spacing between OPT1, OPT2, GND and VCC does not allow to connect jumpers. You have left OPT1 and OPT2 floating which does not allow to configure the baud rate, as explained in the MN5010HS Design Guidelines. What are the reasons why you left OPT1 and OPT2 floating, and how come didn't you separate them with 0.1" standard pin headers? (either power-on or reset). Note that these signals do not have internal pull-up or pull-down resistors. So why they are floating is a mystery to me. 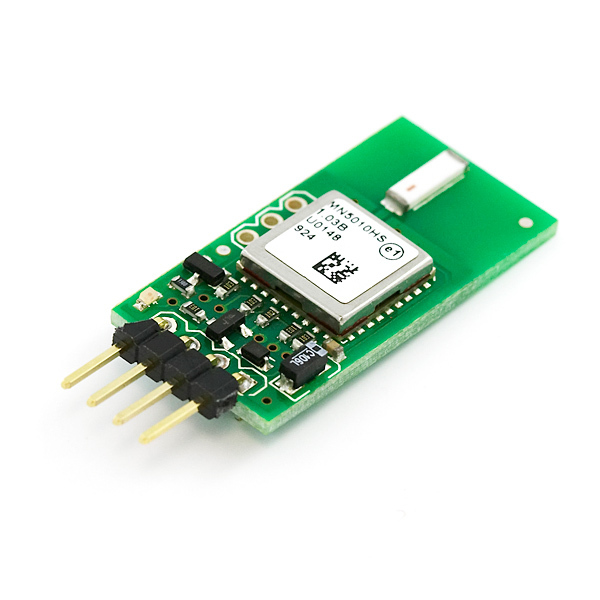 i bought this micro-mini gps recently and gps module cannot get a lock. Do i need to buy an antenna? please let me know. There is a passive antenna already on the unit. I just bought this micromini gps. I am trying to interface the gps with the microcontroller PIC24F. I am not being able to stop the data. I am sending the command $PUNV,STOP*29 with and without /r/n at the end of the line. But it does not work. All it does is read some random characters in the lcd. Also does the gps keep sending any data (default) when it does not have any reception too? try using the proper escape characters, \r\n, not /r/n. all parsers require some knowledge of how a command starts and ends. Mine sends a burst of data every second even without a fix. I think you can slow down or disable the update with $PSRF103, documented in one of the links above. Also make sure your baud rate is right, it defaults to 4800 (and resets to that if it loses power). 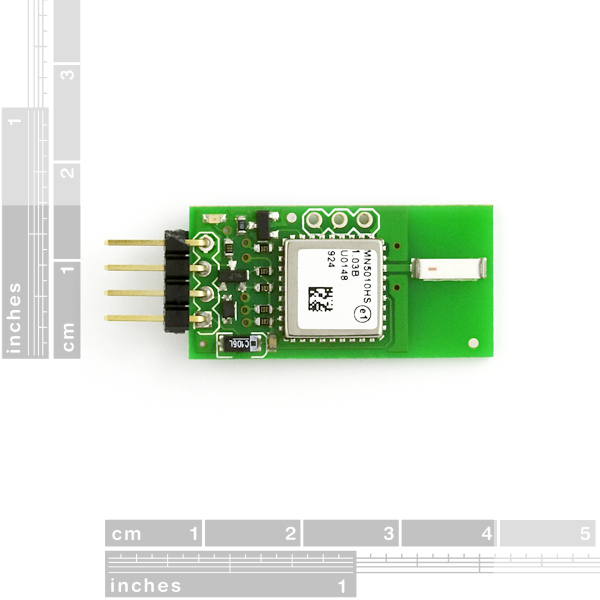 What is the best orientation for this gps chip and antenna? Well, I guess I can join the club on not being able to send this thing commands. Can someone post a definitive answer on how to get this thing to pay attention. Getting data and a lock I can do. Get it to listen to commands (using RealTerm) I cannot. Hello, I am pretty much a noob with this device. I am trying to display the data by connecting this module to the Arduino Mega 2560 board and outputting the messages with the serial monitor. However, through playing I have no idea how to start off the code and define the registers to get this device working. Can someone help me? Out of interest, why did you put the ceramic antenna positioned horizontally on the board? If it was simply rotated 90degrees the whole board could have been much smaller! I am using these ten modules. It operates first without trouble. However, time information put it away after a delay of one second while most modules' using it. It remains being one second late though I did ColdStart. 1. Isn't there method of the return to the first state? 2. Does not another have the person who got this symptom? Please give information to me when there is a person who is using it. I have no problem receiving data from the GPS Micro-Mini and I have no problem with getting a a fix. However, like others I'm unable to communicate with the unit using the $PUNV... commands. I get no response whatsoever. Not even an error message. Any ideas? I have the same problem. Somebody have solve this problem? The problem is I am using this with a Zigbit module that requires 3.0V (will work at 3.3)and so I do not want to have to have both voltages. any suggestions on how to get this thing to work correctly at 3.3v? "Note: To send a NMEA command to the module, you need to send a /r/n or hit Ctrl-Enter to send the command from a terminal program." This antenna needs to be horizontal right? Is there a reason, other than logistical packaging issues, why these header pins are not soldered vertically so I don't need to tip the breadboard sideways? Otherwise, these chip antennas amazingly well -- even for getting first lock indoors. This module seems to consume very little power, out performs some of our past ceramic antenna designs, and is quite a hit with us. In the schematic is placed a capicitor in series to the antenna. On the pictures of the print, I don't can find this. What is correct now? I have similar problems with this GPS. Walking outdoors for about 30 minutes (twice !) gave no position fix. Serial data runs ok. A EM-406 receiver that was run also during that test gave normal fix in about 5 minutes. What's wrong with Micro-Mini GPS? I am also having problem to get lock. My GPS micro-mini module is connected to Sparkfun's serial-USB FTDI board. Could the 3.3V power supply be the issue here? Would 5V supply help? Did you make any experience here? Thanks. We test all of our GPS boards for locks. The microMini GPS will get a lock in less than a minute outside here at Spark Fun. If you are having issues, the best idea would be for you to return the device back to us for testing. If you still are having issues, there could be environmental factors that are causing interference. Things to keep in mind if you are having trouble; regulate your power supply (preferably to 3.3V in the microMini's case), minimize interference from other electronics, try not to test the unit in you hand (the impedance will be raised and this will de-tune the antenna network), and be sure to test the unit outside. I've connected this module with your BB FT232RL USB>Serial, i had no problem in receiving data from it ... but I can't get any fix !!! but nothing happens ... where I'm wrong ? what is CtrlEnter? you mean \r\n? I am experimenting with the other version (GPS Micro-Mini with SMA Connector) of this GPS and I have the same problem.. I can read all the data coming from the gps but I get no response from the $PUNV commands that I send from the terminal program (as command line text or as text file with different versions of /r/n at the end of the line). i using arduino bluetooth, but i can't see in serial monitor.